A common focus, the community of onlookers, human creatures of the earth, gazing at THE sun of the universe. Exclamations of emotions, expressions of amazement at the celestial experience. Viewing eyes covered and protected, mouths gaping wide with joy mingled with tears, describes the typical image of gazers. The experienced scientists, the newscasters, world travelers, the old, and the young were all impressed with the event that equalized humanity. An apparent reality emerged, as a human creature, we all live under the same sun. The intense darkness that seemed to consume the sun stirred a wonder as the world watched. The action of creation is evidence of the presence God. Opening our senses to the presence of creation will open our awareness of God. Sitting alone, in my empty grassy backyard, I observed a 95% blockage of the sun. I felt an exhilaration and awe as I experience the response of nature around me. The insects and birds were still, the temperature dropped as the light faded, I felt a connection with the moment. A connection with THE creator of the sun. Wearing “glasses” with an intense filter allowed me to look directly at the powerful light, an amazing perfectly shaped sphere; placed with a purpose in the ordered universe. The moon is 400 times closer to earth than the sun and the sun is 400 times larger than the moon, a reality that makes a total eclipse possible. A probability steeped with purpose. The gazers, who made intentional plans to view the eclipse, were not disappointed. They were amazed and moved with a positive emotion. The amazement crossed all gender and cultural boundaries. What stirred in their hearts? The wonder of creation? A realization of a divine presence? 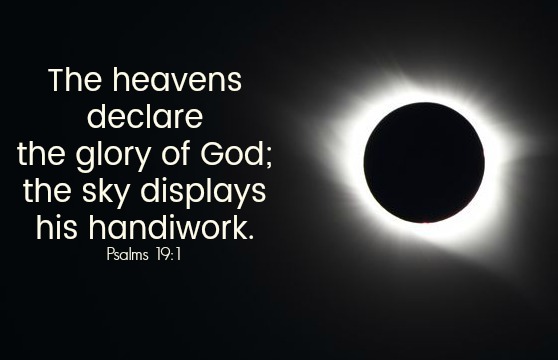 Why would God arrange an eclipse? I would like to think because he was us to feel this wonderment and joy. I felt thankful, amazed, cared for, and elated to be known by the creator of this universe. How could anyone gaze upon this celestial event and not feel the wonder, see the light and seek the life that has been given to us by our Father in heaven, the creator? His intricate creation given as a display of His love. His son given as an anchor of His grace for us. My help, my protection, my provision comes from the creator of the universe! Open, Lord my eyes that I may see. Open, Lord, my ears that I may hear. Open, Lord, my heart and my mind that I may understand the vastness of your presence, provision, protection, and peace authored by your eternal love for your created. Wonder, by Hillsong, expresses the wonder of life seen in the light of the God’s way of the vivid color of grace and forgiveness.